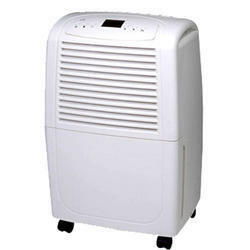 Refrigerant Dehumidifier The most common dehumidifier used is the refrigerant type. It is cheap to produce, easy to operate and effective in most domestic and commercial applications. The primary benefit of a refrigerant dehumidifier is that it performs exceptionally well when used in warm, humid conditions. One of the most important things to understand about a refrigerant dehumidifier is that the performance is directly related to the difference between the air dry bulb temperature and the air dewpoint temperature. A refrigerant dehumidifier is essentially a re-arranged portable air conditioning unit, where the air is first passed across the evaporator coil to cool it, then across the condenser coil to heat it. The air becomes both warmer and drier. The cold evaporator coil reduces the air temperature to a point where condensation occurs. Condensation formed on the cold coil then drips into a collection tray. Water is either drained away or collected in a container in the base of the unit. As the surrounding air becomes drier the dewpoint is lowered, so the temperature necessary to create condensation on the cold evaporator coil, also becomes lower. Even with an evaporator coil temperature of 0°C, it is unlikely that the air will be reduced much below 10°C dewpoint (it is worth noting that air at 20°C, 50% RH already has a dewpoint below 10°C). If the dewpoint of the air is already low, the coil temperature necessary to create condensation can easily be subzero. At this point, the operating efficiency of a refrigerant dehumidifier is greatly reduced. The evaporator begins to freeze as airborne water vapour makes contact with the cold tube surface. Defrosting of the coil is then necessary. Defrosting is normally achieved by allowing hot refrigerant gas from the compressor directly into the evaporator coil. During the defrost cycle, the dehumidifier process ceases to remove water from the air. We offer Portable Refrigerant Dehumidfiers to our clients. Our Dehumidifiers are available as standard units as well as packaged with pre-cooling, after-cooling, heating, heat recovery etc. for the most cost efficient environment control in various industrial applications. Units are designed with custom configurations of standard components to meet unique project requirements. Total system intefration is also available inclusing heating, cooling, bye-pass, pre filter for complete air handling and environment control needs.- High Quality- Hygienic Design- Easy to Assemble on Site- Commissioning by our Skilled Service Engineers Features Available in size form 100 CMH to 50,000 CMH Standard products include fully functional units with necessary safeties and electric relay based controls or optional PLC based Controller. Desiccant rotor technology removes water directly from the air. Designed for industrial process, including low dew point applications. Available with integrated pre and post cooling systemsfast , simple access to all electrical and mechanical components through hinged doors or removable access panels Desiccant cassette can be removed for cleaning to extend rotor life and efficiency Choice of Gas, Steam and Electric Reactivation Standard features include easy access inlet filters, self adjusting /tensioning rotor drive components and easy seal adjustment. Robust industrial duty structural frame and panel design Highly compact design-lowest foot print area. fully factory assembled, reduced installation time on site and lesser costs. 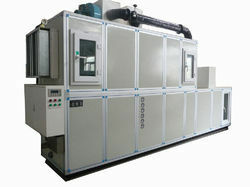 Operating Principle Rehoboth dehumidifiers operate on the principle of adsorption of water vapor from the air. The desiccant used is silica gel, which is formed on an inorganic substance. The desiccant and substrate are arranged in a wheel-shaped rotor matrix having thousands of small parallel air passages extending through its thickness. The desiccant rotor is housed in a cabinet that is separated into process and reactivation sections. In the process section, moist air passes through the rotor, and the silica gel adsorbs the moisture To drive the absorbed moisture out of the desiccante, the rotor slowly rotates into the reactivation section, where a second heated air is usually exhausted outside. The reactivated desiccant rotor rotates back into process section to provide continuous drying of the process air. In many applications, the process air is cooled before entering the desiccant rotor the enable the system to produce dry air. The reactivation air stream may be heated by electricity, steam, hot water, or natural gas depending on the application and available utilities. 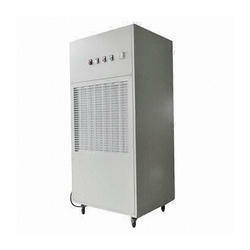 Looking for Refrigerant Dehumidfier ?